Flywheel energy storage (FES) works by accelerating a rotor (flywheel) to a very high speed and maintaining the energy in the system as rotational energy. The energy is converted back by slowing down the flywheel. Most FES systems use electricity to accelerate and decelerate the flywheel, but devices that directly use mechanical energy are being developed. Advanced FES systems have rotors made of high strength carbon-composite filaments that spin at speeds from 20,000 to over 50,000 rpm in a vacuum enclosure and use magnetic bearings. Such flywheels can come up to speed in a matter of minutes—much quicker than some other forms of energy storage. A typical system consists of a rotor suspended by bearings inside a vacuum chamber to reduce friction, connected to a combination electric motor/electric generator. First generation flywheel energy storage systems use a large steel flywheel rotating on mechanical bearings. Newer systems use carbon-fiber composite rotors that have a higher tensile strength than steel and are an order of magnitude lighter. Magnetic bearings are necessary; in conventional mechanical bearings, friction is directly proportional to speed, and at such speeds, too much energy would be lost to friction. The expense of refrigeration led to the early dismissal of low temperature superconductors for use in magnetic bearings. High-temperature superconductor (HTSC) bearings however may be economical and could possibly extend the time energy could be stored economically. Hybrid bearing systems are most likely to see use first. High-temperature superconductor bearings have historically had problems providing the lifting forces necessary for the larger designs, but can easily provide a stabilizing force. Therefore, in hybrid bearings, permanent magnets support the load and high-temperature superconductors are used to stabilize it. The reason superconductors can work well stabilizing the load is because they are good diamagnets. If the rotor tries to drift off center, a restoring force due to flux pinning restores it. This is known as the magnetic stiffness of the bearing. Rotational axis vibration can occur due to low stiffness and damping, which are inherent problems of superconducting magnets, preventing the use of completely superconducting magnetic bearings for flywheel applications. Since flux pinning is the important factor for providing the stabilizing and lifting force, the HTSC can be made much more easily for FES than for other uses. HTSC powders can be formed into arbitrary shapes so long as flux pinning is strong. An ongoing challenge that has to be overcome before superconductors can provide the full lifting force for an FES system is finding a way to suppress the decrease of levitation force and the gradual fall of rotor during operation caused by the flux creep of SC material. For the basic physics of a flywheel, see Flywheel Physics. Compared with other ways of storing electricity, FES systems have long lifetimes (lasting decades with little or no maintenance; full-cycle lifetimes quoted for flywheels range from in excess of 105, up to 107, cycles of use), high energy densities (~ 130 W•h/kg, or ~ 500 kJ/kg), and large maximum power outputs. The energy efficiency (ratio of energy out per energy in) of flywheels can be as high as 90 percent. Typical capacities range from 3 kWh to 133 kWh.Rapid charging of a system occurs in less than 15 minutes. In the 1950s flywheel-powered buses, known as gyrobuses, were used in Yverdon, Switzerland, and there is ongoing research to make flywheel systems that are smaller, lighter, cheaper, and have a greater capacity. It is hoped that flywheel systems can replace conventional chemical batteries for mobile applications, such as for electric vehicles. Proposed flywheel systems would eliminate many of the disadvantages of existing battery power systems, such as low capacity, long charge times, heavy weight, and short usable lifetimes. Flywheels may have been used in the experimental Chrysler Patriot, though that has been disputed. Flywheel systems have also been used experimentally in small electric locomotives for shunting or switching, e.g. the Sentinel-Oerlikon Gyro Locomotive. Larger electric locomotives, e.g. British Rail Class 70, have sometimes been fitted with flywheel boosters to carry them over gaps in the third rail. Advanced flywheels, such as the 133 kW•h pack of the University of Texas at Austin, can take a train from a standing start up to cruising speed. During the 1990s Rosen Motors developed a gas turbine-powered series hybrid automotive powertrain using a 55,000 rpm flywheel to provide bursts of acceleration which the small gas turbine engine could not provide. The flywheel also stored energy through regenerative braking. The flywheel was composed of a titanium hub with a carbon fiber cylinder and gimbal mounted to minimize adverse gyroscopic effects on vehicle handling. The prototype vehicle was successfully road tested in 1997 but was never mass produced. The Parry People Mover is a railcar which is powered by a flywheel. It was trialed on Sundays for 12 months on the Stourbridge Town Branch Line in the West Midlands, England during 2006 and 2007, and will be introduced as a full service by the train operator London Midland in December 2008 once two units have been ordered. Flywheel power storage systems in current production (2001) have storage capacities comparable to batteries and faster discharge rates. They are mainly used to provide load leveling for large battery systems, such as an uninterruptible power supply for data centers. Flywheel maintenance in general runs about one-half the cost of traditional battery UPS systems. The only maintenance is a basic annual preventive maintenance routine and replacing the bearings every three years, which takes about four hours. A long-standing niche market for flywheel power systems are facilities where circuit-breakers and similar devices are tested: even a small household circuit-breaker may be rated to interrupt a current of 10,000 or more amperes, and larger units may have interrupting ratings of 100,000 or 1,000,000 amperes. Obviously the enormous transient loads produced by deliberately forcing such devices to demonstrate their ability to interrupt simulated short circuits would have unacceptable effects on the local grid if these tests were done directly off building power. So typically such a laboratory will have several large motor-generator sets, which can be spun-up to speed over some minutes; then the motor is disconnected before a circuit breaker is tested. Other similar applications are in tokamak and laser experiments, where very high currents are also used for very brief intervals. The Incredible Hulk roller coaster at Universal's Islands of Adventure features a rapidly accelerating uphill launch as opposed to the typical gravity drop. This is achieved through powerful traction motors that throw the car up the track. To achieve the brief very high current required to accelerate a full coaster train to full speed uphill, the park utilizes several motor generator sets with large flywheels. Without these stored energy units, the park would have to invest in a new substation and risk browning-out the local energy grid every time the ride launches. Since FES can store and release energy quickly, they have found a niche providing pulsed power (see compulsator). The FIA has included the use of KERS (see kinetic energy recovery system) as part of its Formula 1 2009 Sporting Regulations. Using a continuously variable transmission (CVT), energy is recovered from the drive train during braking and stored in a flywheel. This stored energy is then used during acceleration by altering the ratio of the CVT. . In motor sports applications this energy is used to improve acceleration rather than reduce carbon dioxide emissions—although the same technology can be applied to road cars to improve fuel efficiency. Automobile Club de l'Ouest, the organizer behind the annual 24 Hours of Le Mans event and the Le Mans Series, is currently "studying specific rules for LMP1 which will be equipped with a kinetic energy recovery system." Beacon Power plans to open an electrical power frequency regulation plant before 2009. Lower carbon emissions, faster response times and ability to buy power at off-peak hours are among some advantages of using flywheels instead of traditional sources of energy for peaking power plants. Flywheels are not affected by temperature changes as are chemical rechargeable batteries, nor do they suffer from memory effect. They are also less potentially damaging to the environment, being made of largely inert or benign materials. Another advantage of flywheels is that by a simple measurement of the rotation speed it is possible to know the exact amount of energy stored. However, use of flywheel accumulators is currently hampered by the danger of explosive shattering of the massive wheel due to overload. One of the primary limits to flywheel design is the tensile strength of the material used for the rotor. Generally speaking, the stronger the disc, the faster it may be spun, and the more energy the system can store. When the tensile strength of a flywheel is exceeded the flywheel will shatter, releasing all of its stored energy at once; this is commonly referred to as "flywheel explosion" since wheel fragments can reach kinetic energy comparable to that of a bullet. Consequently, traditional flywheel systems require strong containment vessels as a safety precaution, which increases the total mass of the device. Fortunately, composite materials tend to disintegrate quickly once broken, and so instead of large chunks of high-velocity shrapnel, one simply gets a containment vessel filled with red-hot sand. Still, many customers of modern flywheel power storage systems prefer to have them embedded in the ground to halt any material that might escape the containment vessel. When used in vehicles, flywheels also act as gyroscopes, since their angular momentum is typically of a similar order of magnitude as the forces acting on the moving vehicle. This property may be detrimental to the vehicle's handling characteristics while turning. On the other hand, this property could be utilized to keep the car balanced so as to keep it from rolling over during sharp turns. Conversely, the effect can be almost completely removed by mounting the flywheel within an appropriately applied set of gimbals, where the angular momentum is conserved without affecting the vehicle (see Properties of a gyroscope). This doesn't avoid the complication of gimbal lock, and thus a compromise between the number of gimbals and the angular freedom is needed. A single gimbal, for instance, could free a car for the 360 degrees necessary for regular driving. However, for instance driving up-hill would require a new gimbal mechanism with a new degree of freedom. Two gimbals would theoretically solve this problem and never lock unless your car rolls (something one carefully placed gimbal would not let the car do). An alternative solution to the problem is to have two joined flywheels spinning synchronously in opposite directions. They would have a total angular momentum of zero and no gyroscopic effect. A problem with this solution is that when the difference between the momentum of each flywheel is anything other than zero the housing of the two flywheels would exhibit torque. You would, in effect, have two heavy spinning gears. Both wheels must be maintained at the same speed to keep the angular velocity at zero. Strictly speaking, the two flywheels would exert a huge torqueing moment at the central point, trying to bend the axle. However, if the axle were sufficiently strong, no gyroscopic forces would have a net effect on the sealed container, so no torque would be noticed. ↑ 1.0 1.1 1.2 1.3 1.4 Castelvecchi, D. 2007. Spinning into control. Science News. 171:312-313. ↑ An energy storage device and method of use. World Intellectual Property Organization. Retrieved January 9, 2009. ↑ Storage Technology report. itpower.co.uk. Retrieved January 9, 2009. ↑ 4.0 4.1 Henry Vere, 2007 A Primer of Flywheel Technology. Distributed Energy. Retrieved January 9, 2009. ↑ The Chrysler Patriot. allpar.com. Retrieved January 9, 2009. ↑ Ernest Wakefield, 1998, History of the Electric Automobile: Hybrid Electric Vehicles. Warrendale, PA: SAE. ISBN 0768001250, 332. ↑ Parry People Movers for Stourbridge branch line. London Midland. Retrieved January 9, 2009. ↑ Rich Miller, 2007, Flywheel gains as alternative to batteries. Data Center Knowledge. Retrieved January 9, 2009. ↑ F1 technical regulations. FIA. Retrieved January 9, 2009. ↑ Home Page. Flybrid Systems. Retrieved January 9, 2009. ↑ Road Car Application. Flybrid Systems. Retrieved January 9, 2009. ↑ ACO Technical Regulations 2008 for Prototype "LM"P1 and "LM"P2 classes, page 3. Automobile Club de l'Ouest (ACO). Retrieved January 9, 2009. ↑ Beacon Power Announces Testing of First Megawatt of Flywheel Energy Storage. Beacon Power. Retrieved January 9, 2009. ↑ Flywheel-based Solutions for Grid Reliability. Beacon Power. Retrieved January 9, 2009. El-Wakil, M.M. 1984. Powerplant Technology. New York, NY: McGraw-Hill. ISBN 9780070192881. Koshizuka, N., F. Ishikawa, H. Nasu, M. Murakami, K. Matsunaga, S. Saito, O. Saito, Y. Nakamura, H. Yamamoto, R. Takahata, Y. Itoh, H. Ikezawa, and M. Tomita. 2003. Progress of superconducting bearing technologies for flywheel energy storage systems. Physica C. 386: 444–450. Sheahen, T.P. 1994. Introduction to High-Temperature Superconductivity. New York, NY: Plenum Press. ISBN 9780306447938. Sung, T.H., S.C. Han, Y.H. Han, J.S. Lee, N.H. Jeong, S.D. Hwang, and S.K. Choi. 2002. Designs and analyses of flywheel energy storage systems using high-Tc superconductor bearings. Cryogenics 42: 357–362. Wakefield, Ernest. 1998. History of the Electric Automobile: Hybrid Electric Vehicles. Warrendale, PA: SAE. ISBN 0768001250. Wolsky, A.M. 2002. The status and prospects for flywheels and SMES that incorporate HTS. Physica C. 372–376: 1495–1499. 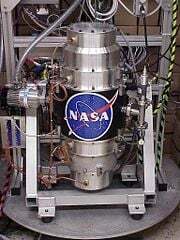 Development at LLNL using passive maglev to levitate the rotor. History of "Flywheel energy storage"
This page was last modified on 17 April 2017, at 23:19.